This book brings the facts of Lakshmi Yantra & its usage i.e. 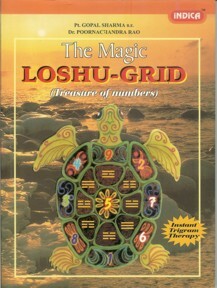 Loshu-Grid the Magic square on tourtise back. This book covers preparation of grid and discovering future trends, compatibility with other persons, Determine the arrows of strength and weekness. Also, explains how to find missing numbers from your date of birth and provides detailed solutions to over come the effects of missing numbers. This book gives you a new vantage point from which to look at your self; one with greater distance and perspective than many other self help systems. Self knowledge is the key to success and freedom. Having a greater in-sight into your strengths and weeknesses will help you in every aspect of life.